Torquay, Torquay, Torquay, probably the best place in the UK to go for a weekend if you're playing again, actually scratch that, it's the best place for a week in the summer/early autumn. Lincoln is quite far from Torquay as you can probably guess. The trip just seems to take forever, even trips to Exeter seemed to take mere hours compared to Torquay, it's just ridiculous. Getting down to Torquay is general easy unless you go via Bristol which is where virtually every single car decides to go just to cause traffic. One you get into Torquay, it doesn't take too long to get the ground and if you get there with plenty of time to spare, I would seriously recommend going down the bay. If you've ever watched Fawlty Towers, which is set in Torquay, it's amazing how many of the locals act like Basil or Cybil, it's amazing. They are generally a nice bunch though and very helpful. 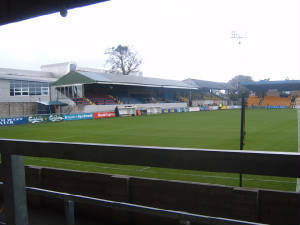 The first time I went to Plainmoor, the coaches just dropped us off in the middle of the road and no-one knew where to go and a local helped us by pointing out the ground was down as dodgy alley. Once inside the ground, it's like a throwback. 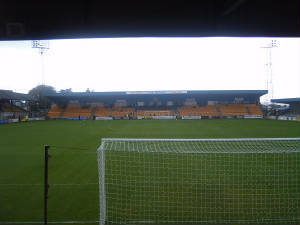 The away terrace is a fairly nice size and offers a suprisingly excellent view of the action. 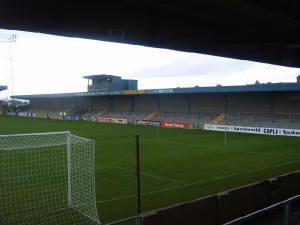 The stand to the right is a pitch length terrace, roughly the same height as the away terrace and this is where the majority of the home fans reside, it's funny seeing the massive rush to switch to the end the Gulls were shooting towards. 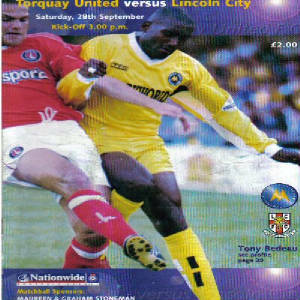 The stand behind the far goal was similar to the Imps Stand at Sincil Bank. The final stand is a very tacky, small seated stand. The atmosphere can be summed in one word, joke. It's quite hard to make any noise and the locals often don't bother even trying to make any noise, they are amoungst the quietest home supporters I've ever seen. Even when they score it isn't that loud. Overall a trip to Plainmoor isn't bad, but it isn't particully good either. I could think of far nicer grounds I'd rather spend 7 hours on a Saturday trying to get to, I'd gladly travel the extra hour or so just to go to Plymouth instead of Torquay.